Faced with the pressure to quickly expand their SKU count 20 times over to stay competitive and grow, this major retailer turned to Ugam for help. 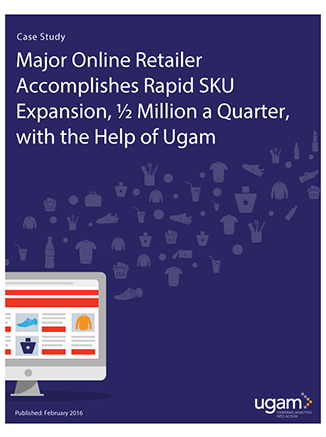 In a matter of weeks, Ugam exceeded expectations by onboarding ½ million SKUs, a quarter of their goal of two million SKUs. This retailer selected Ugam for the following reasons: deep domain expertise, ability to source data at scale, intellectual property (existing databases of product taxonomies, keywords, descriptions, etc. ), best practice templates, and ability to provide on-site customer support. Access this case study to learn more.